RSMSSB Junior Assistant Admit Card 2018 is Released: The Rajasthan Subordinate and Ministerial Service Selection Board (RSMSSB) announced the RSMSSB Junior Assistant Admit Card 2018. The organization released the RSMSSB Junior Assistant Admit Card or hall ticket for the Junior Assistant, Clerk Grade II positions written exam. We have given the direct download link at the end of this article. Download Admit Card for Direct Joint Recruitment of Clerk Grade-II and Junior Assistant – 2018 (Only for Candidate Names Starting from S to Z and Exam Date 16th September 2018. The more details about the RSMSSB Junior Assistant Admit Card 2018 has provided below. The RSMSSB Junior Assistant Admit Card 2018 is available now to download for the given positions exam through the organization website. The aspirants who had completed the application process and wait for the RSMSSB Junior Assistant Hall Ticket 2018, it will be great news for everyone. Every year the organization had released the notification for recruit the candidates for filling in various position in the organization. And this year also it published the announcement for the Junior Assistant, Clerk Grade II positions in April 2018. For these positions, the online application process will start on 10th May 2018, and the application process will close on 8th June 2018. Our website Sarkari Naukri has provided the direct link to download the admit card or hall ticket for the exam at the end of this page. Download Admit Card for Direct Joint Recruitment of Clerk Grade-II and Junior Assistant – 2018 (Only for Candidate Names Starting from S to Z). For more information, the applicants need to visit the organization website. The Rajasthan Subordinate and Ministerial Service Selection Board will conduct the examination process, i.e., written exam and interview for the given positions. The management will conduct the written test as a first session to shortlist the vast count of applicants. After the written exam, the qualified aspirants will have to face the interview process. Finally, the contenders will need to go through certificate verification. The board selects the people as per the organization rules. For more selection process details the candidates need to check the official notification. The contenders who had successfully applied for the Junior Assistant, Clerk Grade II position written exam of Rajasthan Subordinate and Ministerial Service Selection Board and waiting for the RSMSSB Junior Assistant Admit Card or hall ticket, it was the right news for all the applicable aspirants. The Rajasthan Subordinate and Ministerial Service Selection Board released the issue on admit card or hall ticket through the organization website. For downloading the hall, ticket contenders have to use the roll number and date of birth otherwise it is impossible to download the RSMSSB Junior Assistant Hall Ticket 2018. We advise every contender must download the RSMSSB Junior Assistant Admit Card 2018 from the official website and also from this page through below provided a download link. For more information, the applicants need to visit the official notification of the organization. For the latest updates of the admit card or hall ticket check this article frequently. In present days every competitive or any other board examinations, the organizations had generated the admit card system. The candidates will not allow examination theater without the admit card. Hall Ticket is the mandatory document for the organization to find out the fake contenders in the examination center. The RSMSSB Junior Assistant Admit Card 2018 or hall ticket contains essential details like Applicant Name, Photograph of the applicants, Exam name, Exam Center Name, Exam Center Code, Exam Hall Address, candidates Address, Mother or Father Name, essential instructions for the examination. The aspirants must carry any Identity along with admit card for security purpose. Contenders have to reach before 20 minutes to the examination center to avoid the rushes and check the details at the back of hall ticket. The more information about the RSMSSB Junior Assistant, Clerk Grade II position exam like information in admit card, important documents for the exam, and steps to download the admit card as specified below. Go to the official website of Rajasthan Subordinate and Ministerial Service Selection Board, www.rsmssb.rajasthan.gov.in. Search for the RSMSSB Junior Assistant Admit Card for the given positions. Click on the RSMSSB Junior Assistant Admit Card 2018 download link. Fill the required fields like roll number and date of birth. RSMSSB Junior Assistant Hall Ticket will appear on the screen. 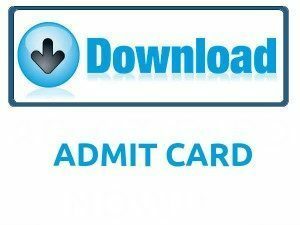 Download the RSMSSB Junior Assistant Admit Card. Submit RSMSSB Junior Assistant Admit Card at the examination center with an identity. In the above page, we have provided the details belong to RSMSSB Junior Assistant Admit Card 2018 and exam. Hope this article will be useful for the contenders who will apply for the Junior Assistant/ Clerk Grade II positions in Rajasthan Subordinate and Ministerial Service Selection Board. Applicants have any doubts about this page can leave a comment on below comment box. For more updates about admit cards, results, syllabus click on sarkarirecruitment.com. Thank you.